March 1936. 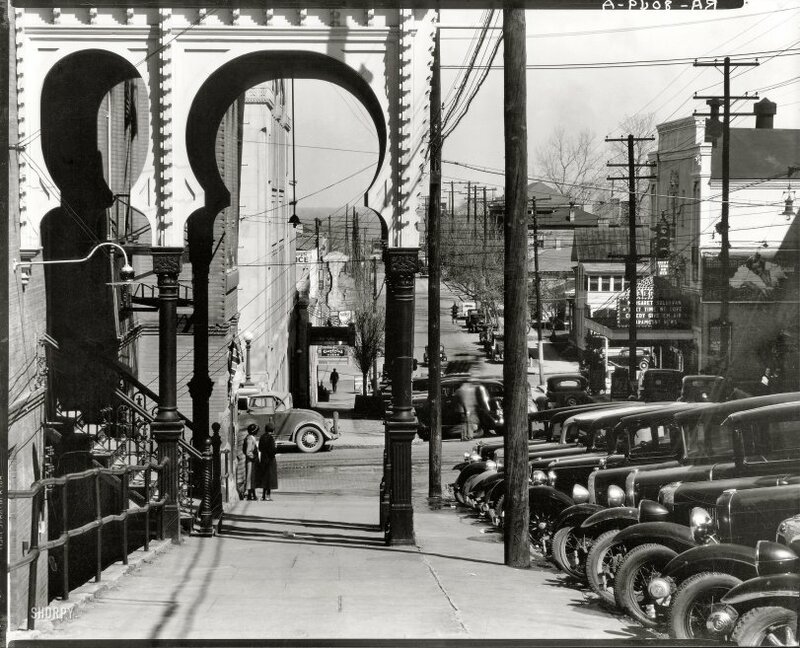 "Street Scene, Vicksburg, Mississippi." Large-format nitrate negative by Walker Evans for the Farm Security Administration. View full size. Submitted by Anonymous Tipster on Tue, 05/12/2009 - 9:36am. This is the side of the Carroll Hotel -Walnut Street side (corner of Clay). Demolished for the parking garage for then First National Bank. Submitted by Anonymous Tipster on Thu, 04/30/2009 - 7:33pm. It looks like Morrissey's is still there today. Submitted by Anonymous Tipster on Wed, 04/29/2009 - 4:48pm. Funny how Margaret Sullavan got top billing on that marquee and Jimmy Stewart isn't even mentioned. And now which one is more likely to be remembered? Submitted by Emma M. on Wed, 04/29/2009 - 1:33pm. It's so strange to see photos like this. This one really does look like a movie still. Submitted by edition_of_one on Tue, 04/28/2009 - 8:51pm. The Saenger Theatre at 1209 Walnut was destroyed by a tornado in 1953, with a number of children inside. Submitted by Jennifridge on Tue, 04/28/2009 - 12:49pm. Every time I see a shot like this, I have to remind myself that this is what the world actually looked like. This is not a scene from a Capra picture, or, to be more topical, "Next Time We Love." Submitted by Anonymous Tipster on Tue, 04/28/2009 - 9:36am. Submitted by Patty Haupt Allen on Tue, 04/28/2009 - 8:41am. In our area, the telephone and utility lines are underground. Their absence, in my opinion, is very much addition by subtraction as far as view is concerned. But, it certainly makes for an interesting juxtaposition at this angle. Submitted by Anonymous Tipster on Tue, 04/28/2009 - 8:13am. Seems a little out of place somehow.